barbie Princess Doll. . HD Wallpaper and background images in the películas de barbie club tagged: barbie the princess all. Huh... Barbie from Fashion Fairytale and Corinne are not a princess. cynti19 I took all the princess AayBreeCia. Yeah; FF's Barbie and Corinne aren't princesses...but, it's lovely! BTW; I see a familiar Barbie logo...lol! I saw it on fake logo of PCS. cool how didi u do it? OMG!!!!!!! I love it I have some of these dolls like Merliah Corinne Babie FF doll and Genevieve. 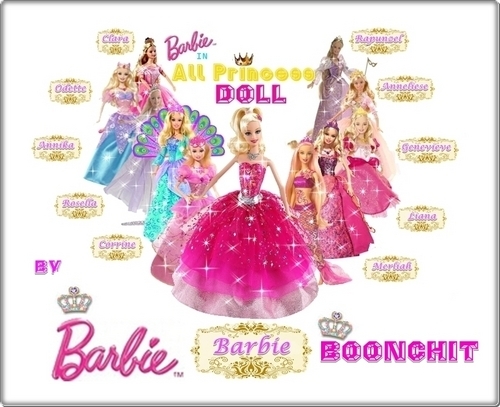 i am having erika ,rosella , ballerina and cinderella doll.moreover, i like your picture,barbieboonchit .